Riyadh continues to strengthen ties with powerful regional armies amid an ongoing air campaign against Houthi fighters in Yemen. It has signed up Egypt for a joint planning of a “major military maneuver” with other Gulf states in Saudi Arabia. During the visit of the Saudi Defense Minister Prince Mohammed bin Salman to Cairo to discuss military campaign in Yemen, both countries agreed to form a joint military committee to discuss the“implementation of a major strategic maneuver in the territory of the Kingdom of Saudi Arabia”, the Egyptian President's office said in a statement. The statement gave no further details on the planned military exercise. The Saudis announced productive discussion on the “areas of strengthening military cooperation” inside the coalition, also affirming Egypt’s role as one of the main acting powers in the region. 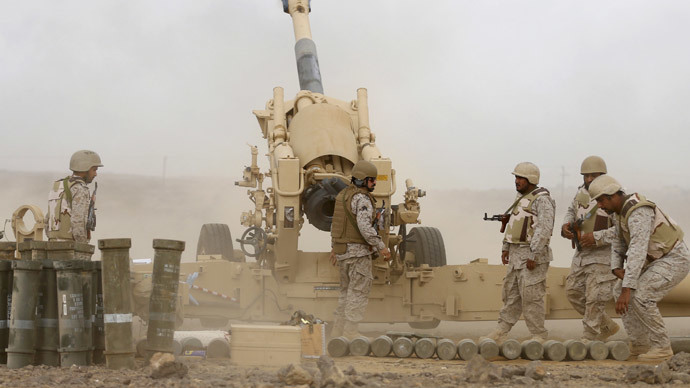 A coalition of countries which includes, Morocco, Jordan, Kuwait, UAE, Qatar, Bahrain, Egypt, and Sudan led by Saudi Arabia, have launched airstrikes against the Shiite Houthi rebels in Yemen some three weeks ago. The coalition airstrikes have inflicted heavy damage on civilian infrastructure in Yemen. Over 1,000 people including many civilians have been killed amid chaos on the ground. The predominantly Sunni Muslim allies are doing their best to return the deposed Yemeni president who fled the country back to power. Meanwhile Arab language channels, including Al Jazeera, reported that Saudi military is boosting its troops presence along Yemeni border, adjacent to the northern Yemeni province of Saada. It has increased the count of tanks, artillery units and border guards that could eventually be used to launch a ground assault on its neighbor. The world’s top arms importer Saudi Arabia is well equipped in case of a ground operation. Last year, the country’s military spending increased by 17 percent, according to the latest SIPRI report. The theocratic monarchy also has the backing of the United States, who so far stayed out of the conflict but has offered some help to its main regional ally, including air intelligence collected by drones over Yemen.